We love mixing modern and old world techniques here at Bella Forte Designs. In this photography portfolio project for Michael Cytrynowicz our team expertly combined inkjet printing on cloth with embossing. The BDF team printed Michael Cytrynowicz Photography Charcoal cloth in black. 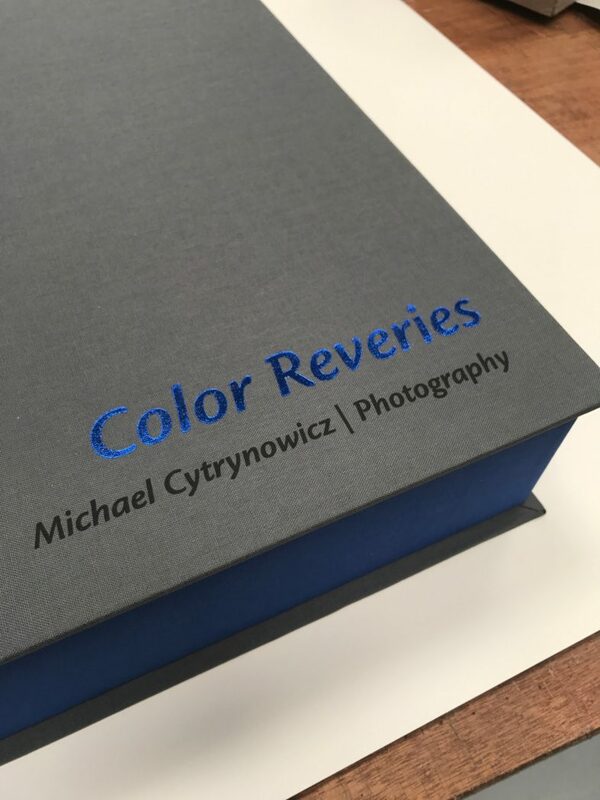 In addition to a sleek gray and black box the title of the project “Color Reveries” is embossed with a custom die. While the black and gray are a popular color combination, the addition of blue foil in the embossing gives this box a look that is uniquely Cytrynowicz’s. Finally the walls are covered in Cornflower Iris cloth. Looking for more embossing inspiration? Seems like our PDF portfolio is just what you are looking for!